Many thanks to everyone for a very successful 2011 WIBA! We had a great time this weekend and enjoyed talking to everyone that we could. 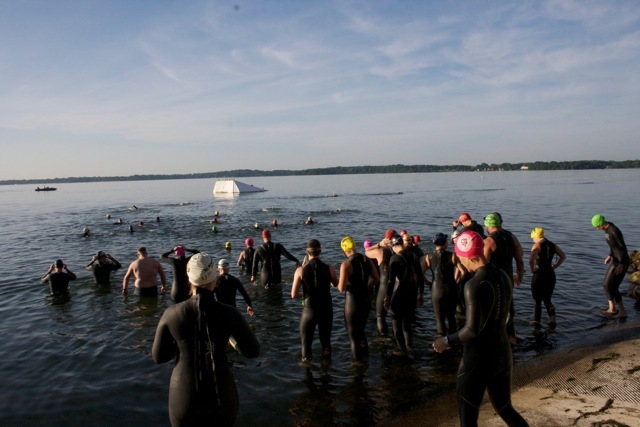 We hope that everyone made it home safely and that the weekend's events gave you a better understanding of the Ironman Wisconsin course and race overall. We had sixty people join us for dinner Friday night, including travelers from as far away as Denver and Baltimore. And, for the record, Denver to Madison by car is 962 miles while Baltimore is only 848 miles. Many thanks to Wyatt from CycleOps for the talk about power and professional triathlete and coach Will Smith for his training and course overview. 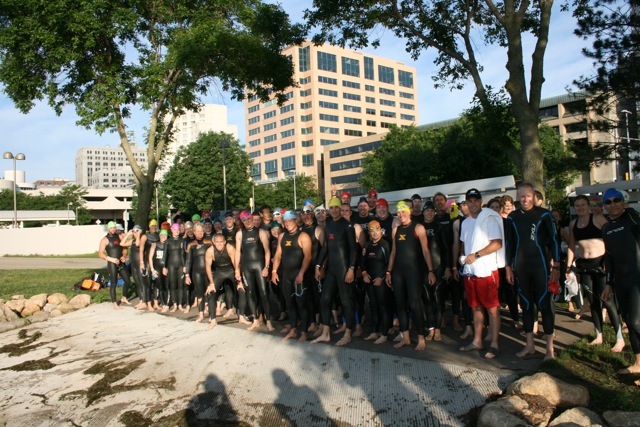 Saturday dawned perfectly with roughly 75 people heading out on to the swim course, some folks trying out Blue Seventy Axis wetsuits made available by fellow WIBA campers. Everyone made it back safely and we headed out to Verona to ride. There, one hundred campers introduced themselves to the bike course, many for two loops and a few hearty souls completing all 112 miles! Seven folks got to try training with power thanks to CycleOps, who even offered a fantastic deal on some training wheels. The grill was hot by the time everyone came back in, cooking brats, burgers and even some black bean and turkey burgers. CycleOps provided prizes for a raffle, including a Magneto trainer and Rev3 provided an entry to their Wisconsin Dells race in 2012! Many thanks to them for the awesome prizes. And last, but not least, the CycleOps blender trainer got put to good use, mixing up margaritas all afternoon. Sunday again was a perfect day, welcoming everyone to the top level of the Monona Terrace to walk through how transition works in and out of the building. We then headed out to the run course, enjoying the scenery and the beautiful day. 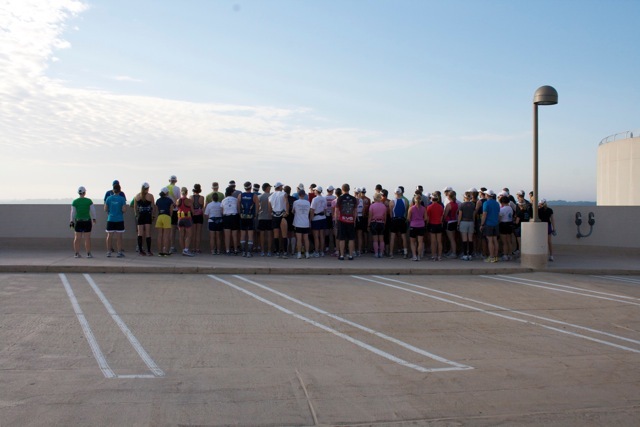 After, folks shared stories about the weekend and enjoyed some post-run treats, said their good-byes and headed home or to Endurance House for some screaming deals on training gear. 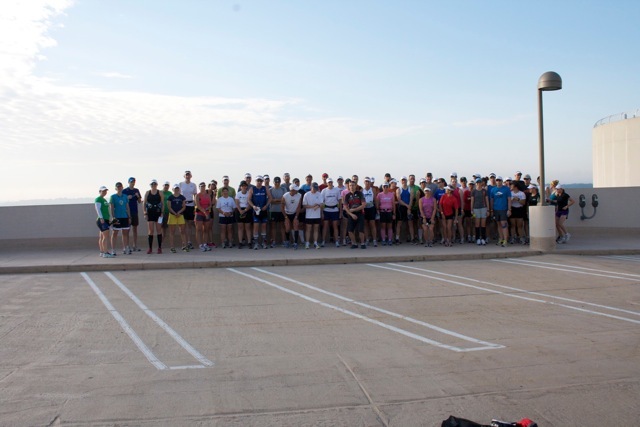 Nearly 70 folks ready to run! A Stu special - facing backwards.